Today we heard about what TO do and what NOT to do in the event of a car accident or breakdown. 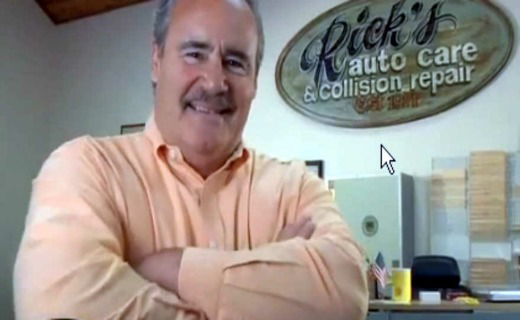 Rick Schumaker and Bruce Bertucci of Rick's Autocare in Highland Park shared their hints and experience. Thanks to Len Dedo for the program arrangements. LAST WEEK we learned about the challenges of Illinois Election Law Changes from CARLA WYCKOFF, our Lake County Clerk. One interesting phenomenon is the continuing decline in voter turnout - despite the many new programs designed to make it easier to vote. Thanks to DAVID BARKHAUSEN for the program. HAPPY DOLLARS - over $600 of them two weeks ago - went towards aid for the Nepal earthquake, and helped kick off the weekend event in Lake Bluff that allowed TOM DICKELMAN and committee to raise over $32,000… amazing! NEXT WEEK we’ll host our annual YOUTH VOLUNTEER RECOGNITION BREAKFAST right here at the Lake Forest Club (NOT at Lake Forest Beach.) This year we’ve had a record response to our requests for students, as over 149 young adults have been nominated for an award. Thanks to Program Chair DAVID BARKHAUSEN and TIM NEWMAN’s office crew for getting this set up for us! MISSING US LAST WEEK were Barth, Belmonte, Commons, Datt, Fiore, Gregory, Hirasawa, Kenehan, Kiely, Kinnucan, Meierhoff, O’Hara, Pattie, Salski, Sibley, Sokolowske, and Swaine. VISITING was MICHAEL LUCAS - guest of Steve Madden. WELCOME BACK the ARTS - Chantler and Lewis - back in the fold after a 3-year haitus. SORRY TO REPORT the resignation of TOM WETTERMAN from the Club - we wish him well SAD TO REPORT the passing of JIM FONDRIEST’s father this week.